The highest priced item in the sale was this gilded Bellamy eagle, with a 25-inch wingspan, carved above a shield with two American flags. It sold to a phone bidder for $42,000. At one time, the flags had been painted over but that paint was removed to show the original colors. 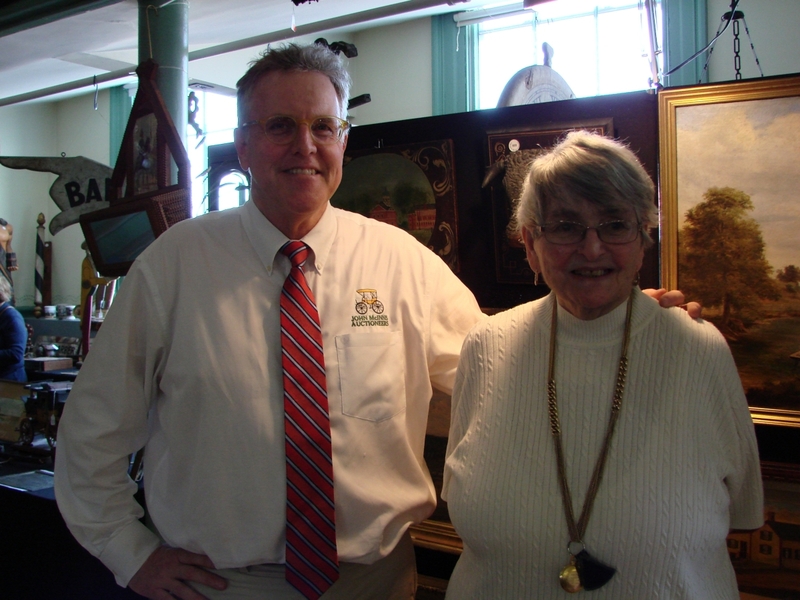 EXETER, N.H. – Eighty-two-year-old Janis Blouin, originally from Georgetown, Mass., and now in an assisted living facility in Hampton, N.H., attended John McInnis Auctioneers’ first sale 38 years ago. She was buying before that and continued until the last few years. Her collection was sold over three days, August 24-26, and divided into 1,600 lots by Dan Meader, McInnis’s gallery director. Blouin exhibited at shows, almost exclusively in the North Shore area, but sometimes going as far as Brimfield, Mass. The most frequently heard comment at the preview was “it isn’t likely there’ll ever be another sale like this,” which referred to the quantity, quality and breadth of the material and the fact that it all came from one home. Clearly, if she liked something, she bought a lot of it. Unbelievably, everything – furniture and all – came out of her small house. 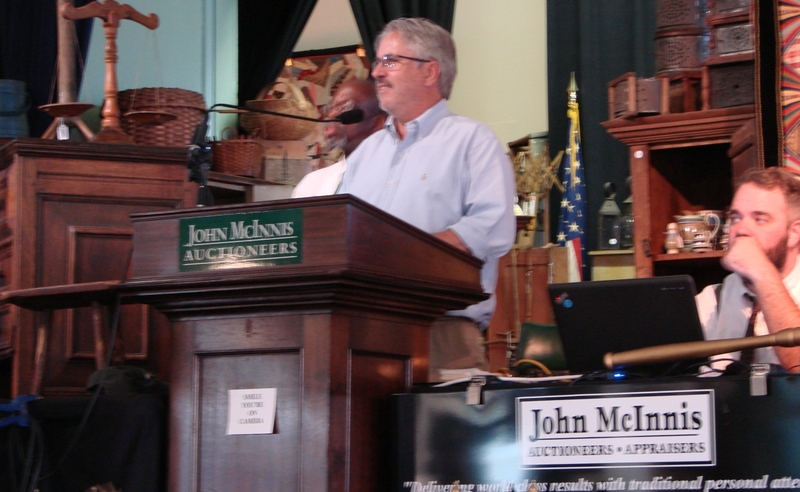 Prices were strong for nearly all categories and estimates were almost meaningless as bidders reacted to the offerings. 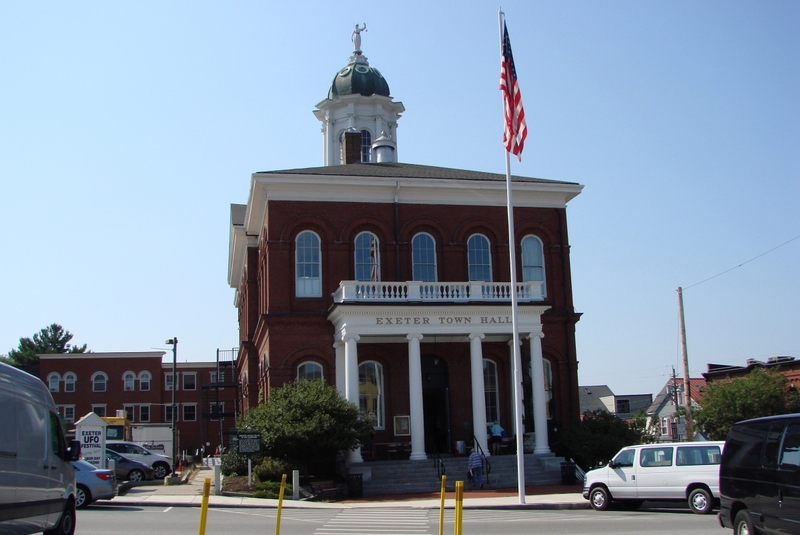 McInnis conducted the sale in the historic old town hall in Exeter, N.H., a fitting setting for the material. 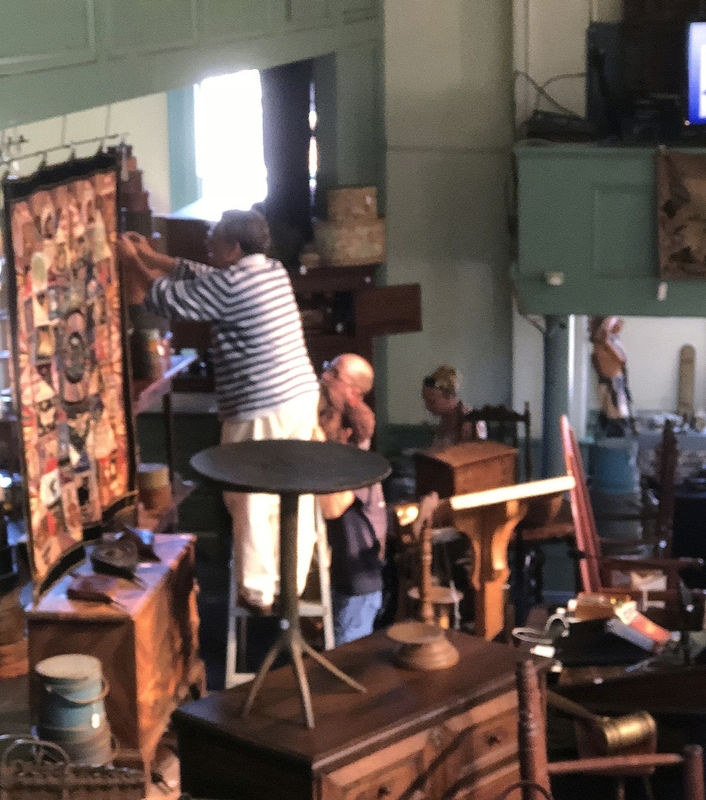 Blouin’s collection was a collection of collections and the sale was carefully organized by collection, so that interested buyers could be there just for the items that most interested them. 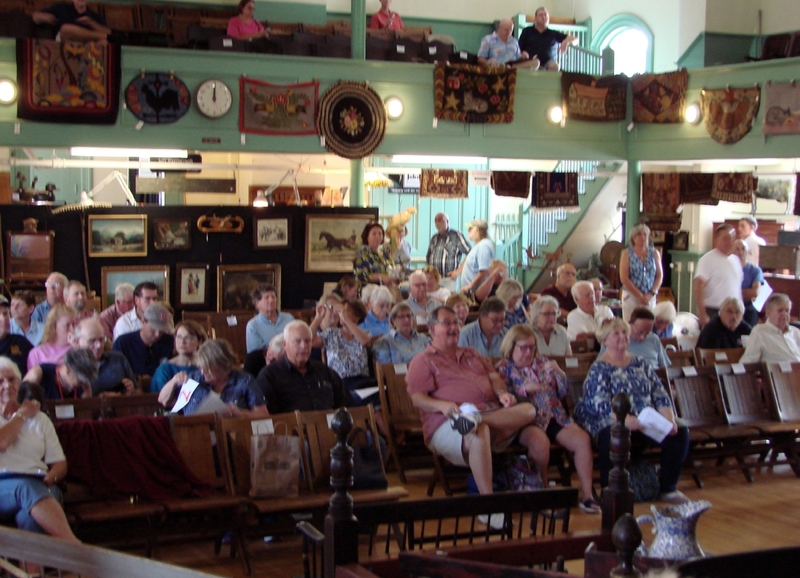 The sale drew numerous bidders, the gallery was full, and internet and phone bidding were available. There were several prices that surprised many in the audience. 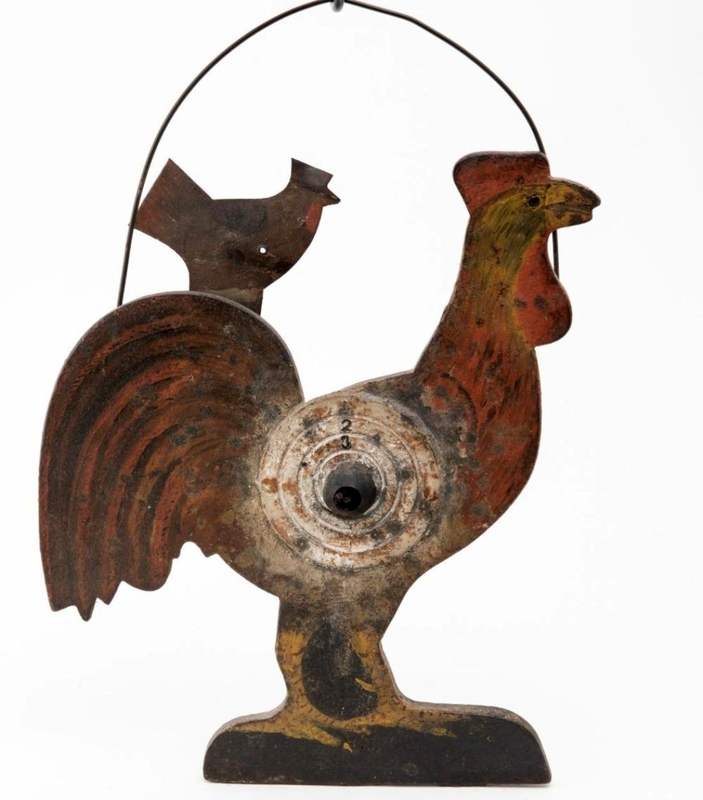 A wonderful patriotic quilt brought $26,400; a grain-painted blanket chest with birds brought $31,200; a cast iron rooster weathervane brought $14,400; a sheep weathervane brought $10,800; a rooster shooting gallery target brought $9,600, to name a few of the strong prices achieved. A short review really can not convey the extent of Blouin’s collection. 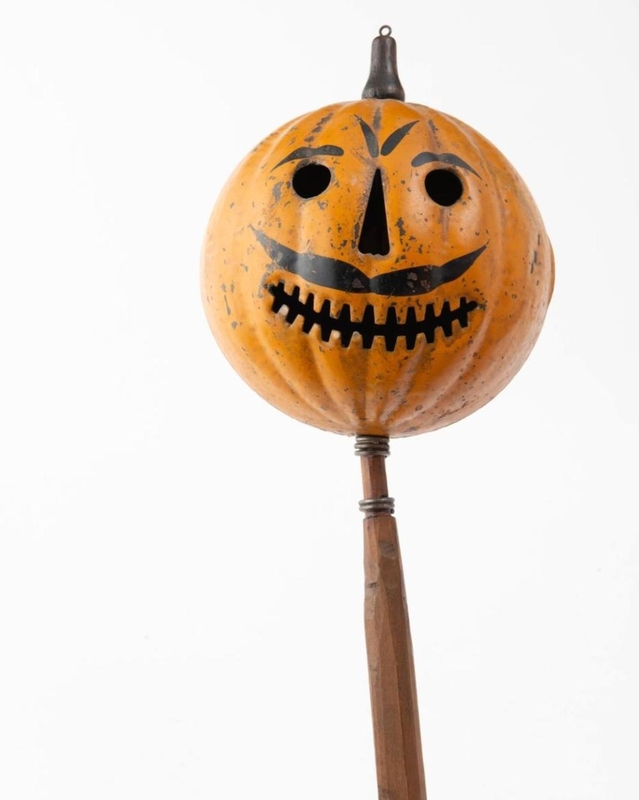 Of more than two dozen Halloween items, a tin parade jack-o-lantern sold for $3,600 and a jack-o-lantern candy container brought $1,200. 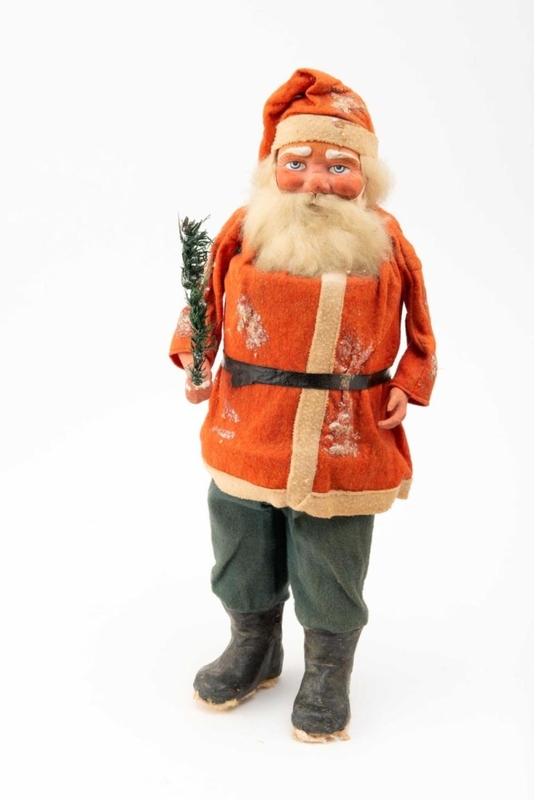 Among the nearly 20 lots of Christmas items, some lots containing more than a dozen ornaments, a 20-inch Santa candy container sold for $3,000. There were more than 75 Staffordshire children’s mugs, with a canary luster mug featuring “A Rabbit for William” transfer reaching $570. 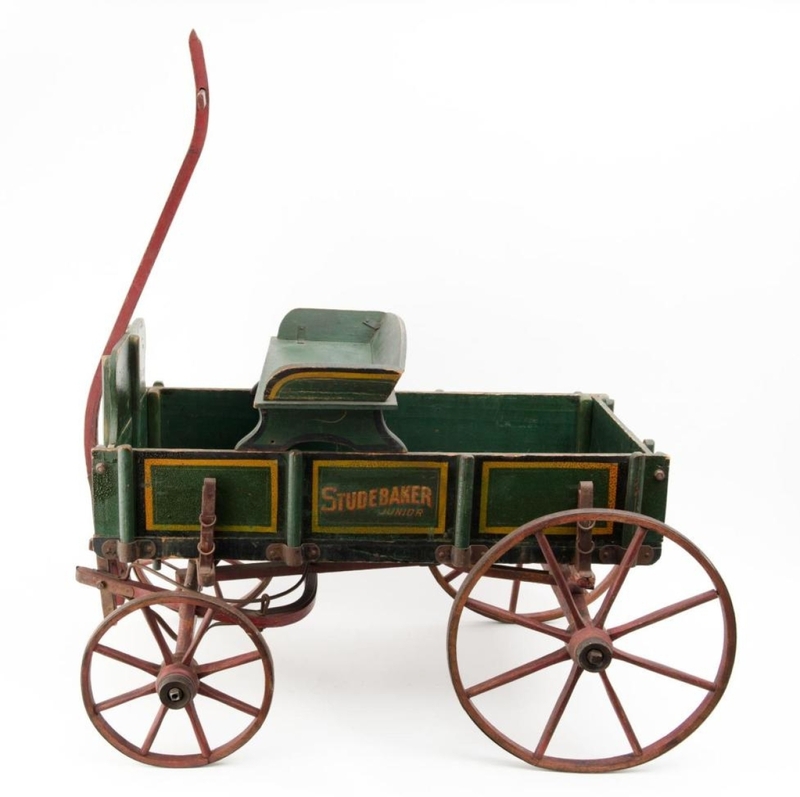 A Stevens “Magic Bank” closed at $840, one of the best of more than 50 banks on offer. There were dozens of toys with a near-mint Kingsbury roadster bringing $1,920. There were teddy bears, dolls and doll house furniture. Most of the seats were taken and there was additional seating on the balcony surrounding the floor. There were boxes and boxes of reference books. There were more than 50 doorstops. A huge box of early, cut nails sold for $90 and a large box with hundreds of old keys sold for $940. More than a dozen Frank Thurlo (1828-1913) watercolors of regional coastal scenes sold, for as much as $570. 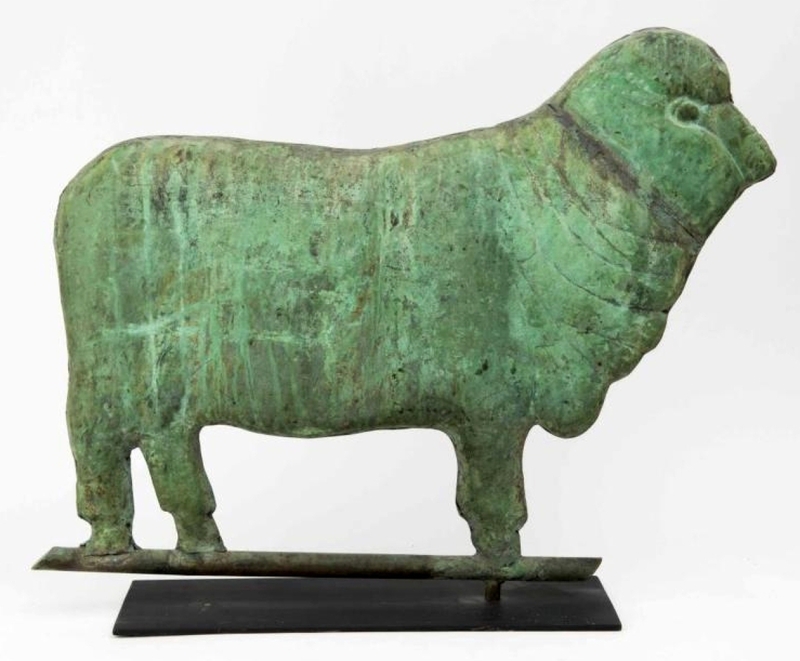 A full-bodied ram weathervane led more than a dozen weathervanes when it closed at $10,800. 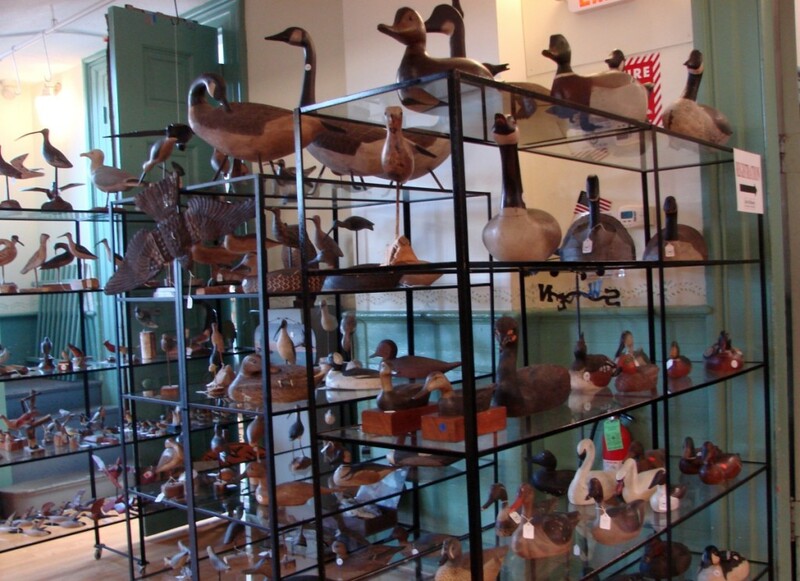 There were close to 200 decoys, including two by George Boyd, whose black duck and mallard drake each sold for $2,040. There were several lots of baskets, hooked rugs, stoneware crocks and jugs and piles of firkins. The list could go on at greater length. 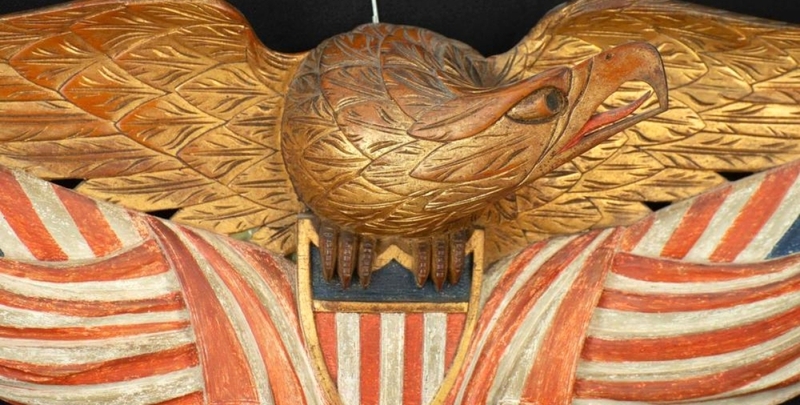 Blouin liked eagles and the highest priced item in the sale was a gilded Bellamy eagle, with a 25-inch wingspread, above a shield with two American flags. It sold to a phone bidder for $42,000. She also liked other Bellamy items, including carved wall shelves with Masonic imagery. There were two and each sold for $702. There were also two rooster carved cigar holders, but with surprisingly little interest from bidders, they went out at $293 each. Probably the most interesting, and historically important, item in the sale was the meticulously pieced and embroidered quilt, dated 1893, which included embroidered elephants, rabbits, swans, a spinning wheel and more. 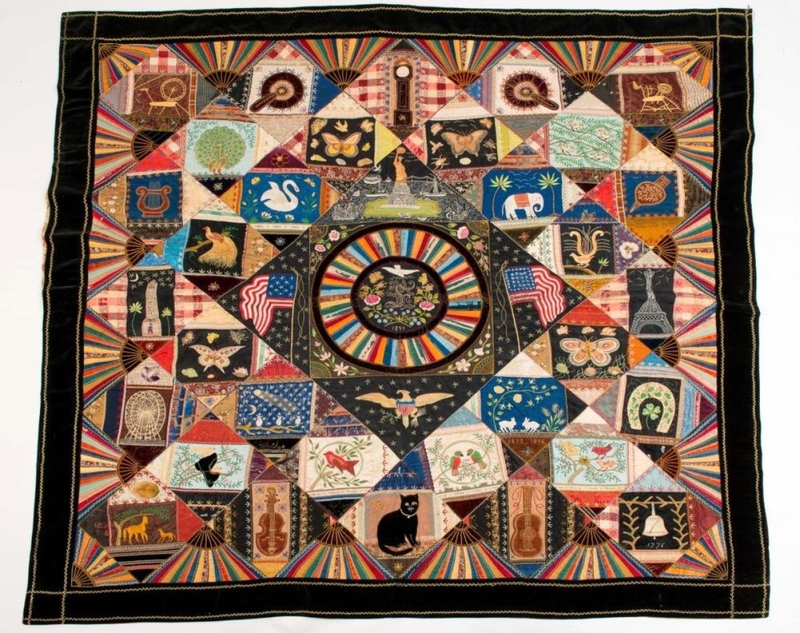 It sold for $26,400 to dealer Stephen Score, bidding by phone, who called it “The I Love America Quilt.” He sees objects differently than some other observers and his excitement about the quilt came through as he later eloquently described it. “It was a remarkable celebration of the life of the maker’s mother, and it was inscribed “Mother 1813-1894.” The many homey images commemorate that life – colorful, folky images that must have seemed as colorful and accessible as the maker’s mother herself. At the center is a central diamond around a colorful circular disc that encloses a white dove, roses and forget-me-nots. Score continued enthusiastically, “The motifs around this central medallion blow me away. The Statue of Liberty on a green Bedloe’s Island, New York Harbor with sailing vessels of all kinds, and the Brooklyn Bridge, which was just completed in 1893. There are two waving American flags, one with 13 stars and the other with 44 stars for each of the states in the Union in 1893. Below all that, is a glorious spread-winged American eagle with a red, white and blue shield at his chest, with sprigs of flowers and lightning bolts in his talons. It is – and was meant to be – a miraculous sight, the central cartouche, the Statue of Liberty, the American flags. This is a work that looks both historically backward and forward and incorporates some of the amazing things that occurred during the mother’s long lifetime and that relate to the life of our country. There were multiple lots of almost everything, as this picture of the decoys shows. 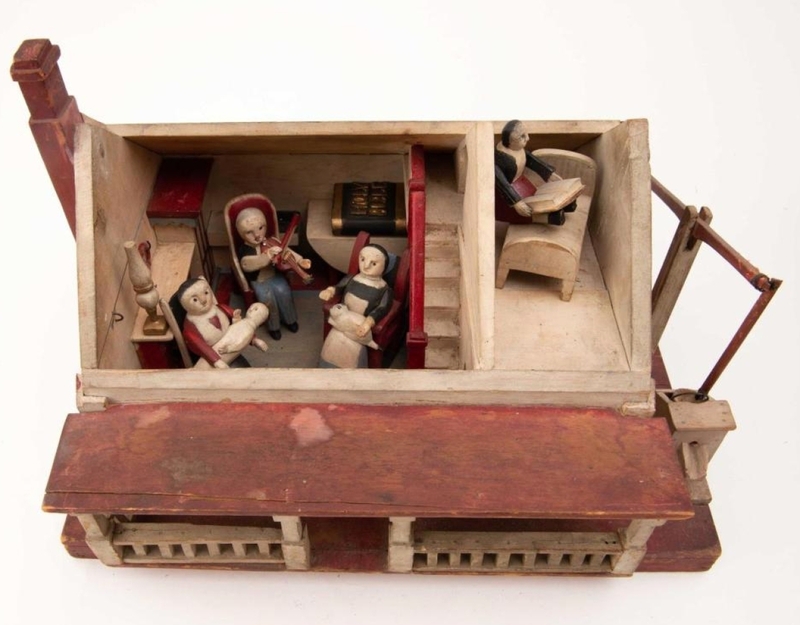 Another particularly interesting item was a small model of a home, which sold to a phone bidder for $6,300. 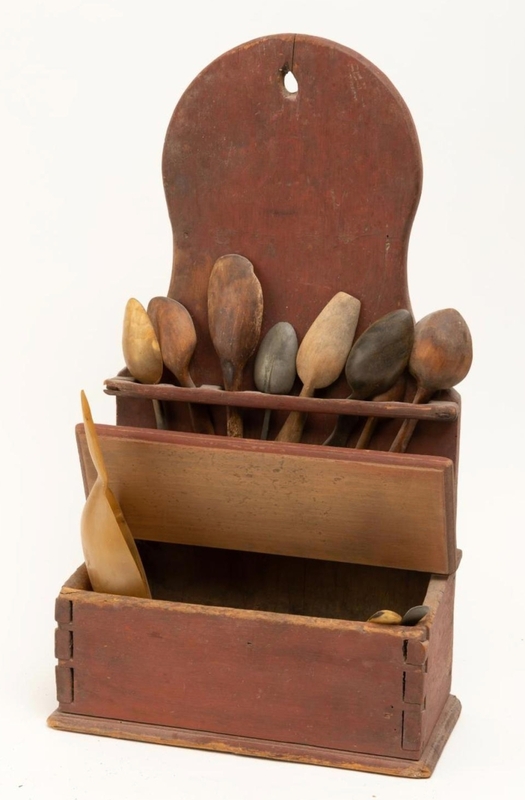 Created by an inmate at the New Hampshire State prison, it was carved and painted, with a porch, a well sweep, a removable roof, furnishings and a family of five. 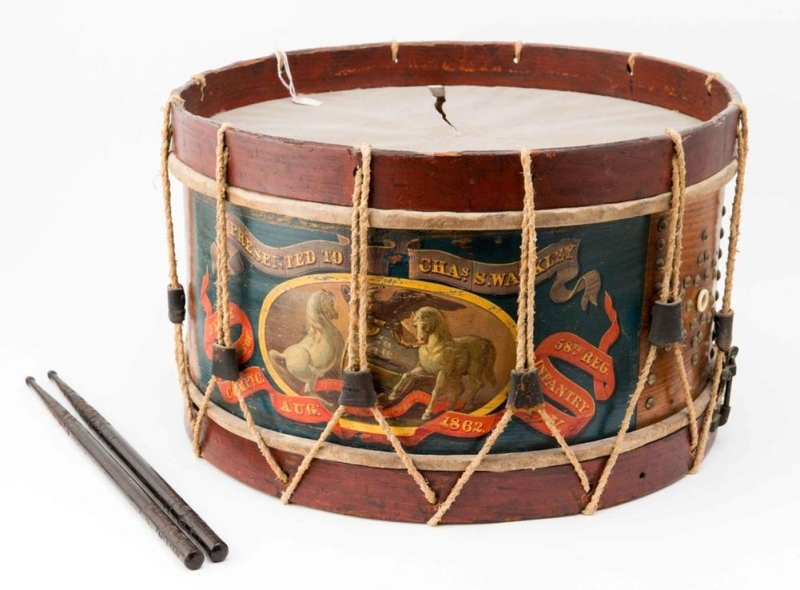 Aside from its interest as a piece of folk art, it demonstrated one of the perils of online bidding. It was originally sold, or so it seemed, to an internet bidder on the first day of the sale for a hammer price of $5,000. That “winner” later said that they had not meant to bid, they were “just hitting buttons, trying to register” for the sale and did not want it. So, McInnis put it up again on the second day of the sale…and it actually brought a few hundred dollars more than it did the first day. Blouin’s home must have been a colorful place. Nearly all the furniture was in original paint and there were stacks of painted firkins and buckets. Shelves in cupboards were filled with painted cast iron banks, redware and stoneware. 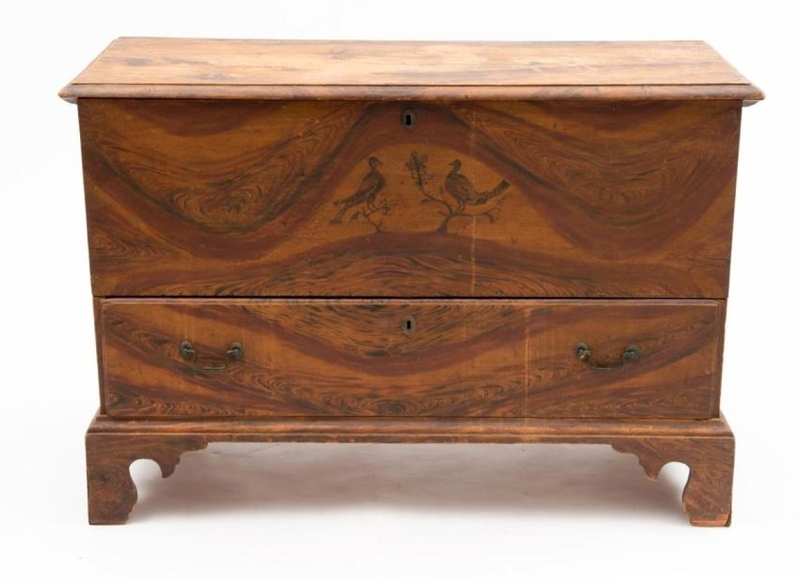 Some of the painted pine furniture pieces included the name of Russell Kettell in their provenance. Kettell was a pioneer in the study of New England furniture and in 1929 wrote The Pine Furniture of Early New England. It was the bible for many early collectors, has been reprinted several times, including as recently as 2012, and is still rated one of the best-selling books on Amazon. One of the pieces Kettell had owned turned out to be one of the top selling pieces in the furniture category. 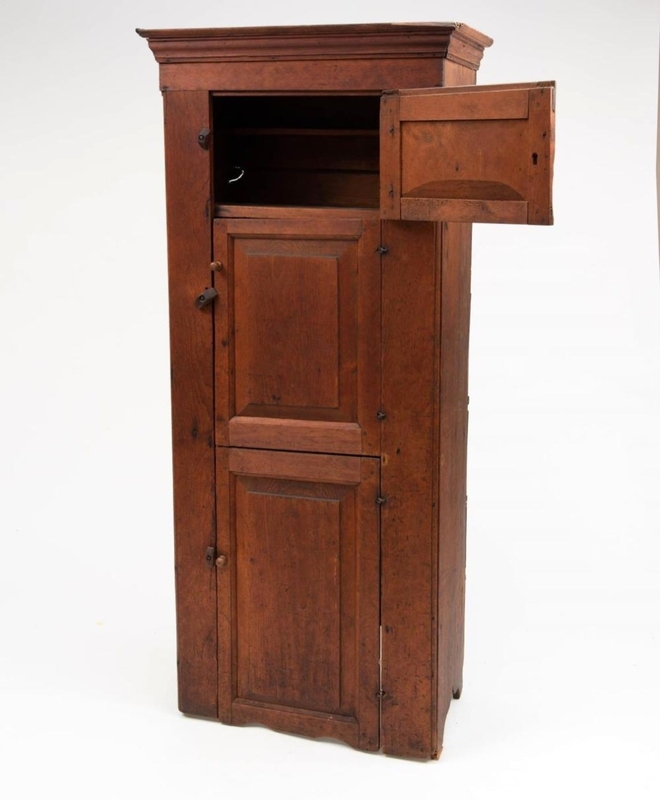 Illustrated in Kettell’s book, it was a red-painted cupboard with three paneled doors and bootjack ends. 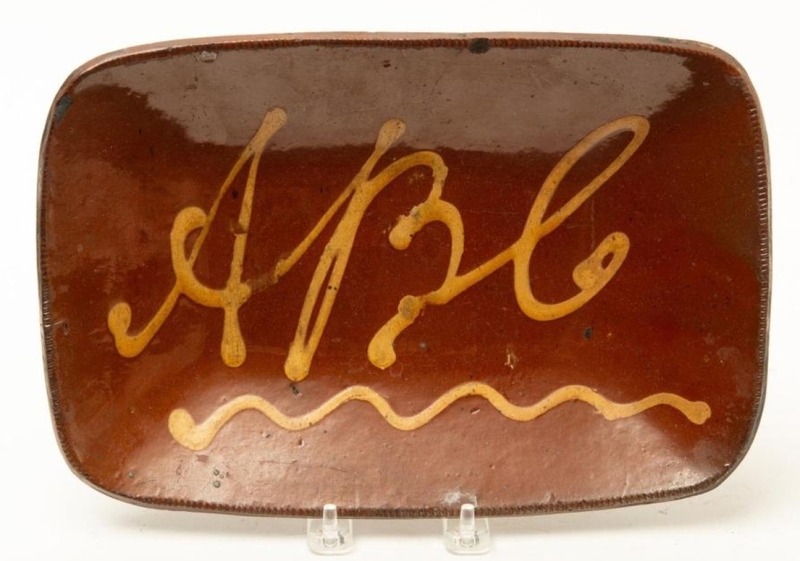 It sold for $19,800, nearly four times the estimate. A small, red hutch table, also illustrated in the book, sold for $4,200. 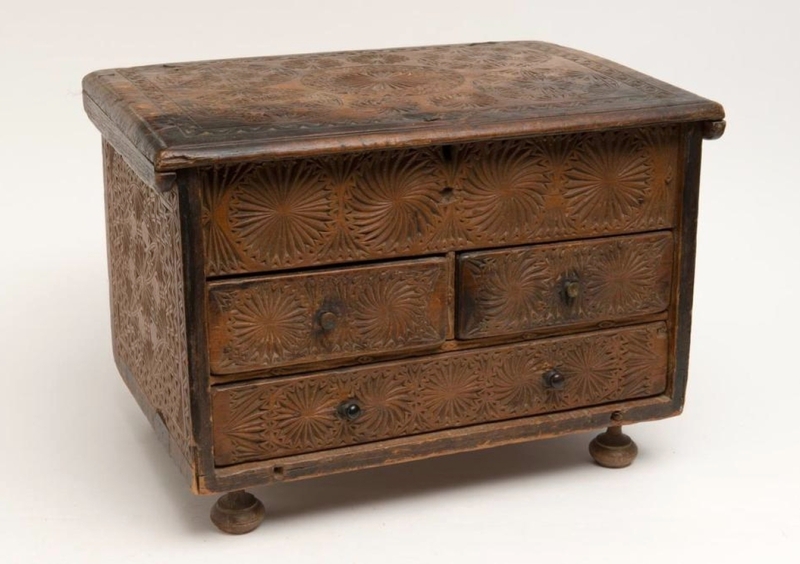 The top lot of the furniture category, however, was a grain-painted blanket chest with crusty polychrome paint in yellow, black and red, with vibrant swirled graining. The front panel was decorated with two birds on branches and the chest was in largely original condition. It was thought likely to have come from Vermont. It sold for $31,200 to a phone bidder. All prices include the buyer’s premium as reported by the auction house. For information, www.mcinnisauctions.com or 978-388-0400. McInnis’s gallery director Dan Meader with Janis Blouin, the woman who had assembled this collection over a lifetime.